Although part of me is loath to clutter the airways with any more year end/best of/top ten/my favorite lists, I feel compelled to add my two cents worth to the mania, if only for my own posterity. Should this blog still exist one, two, or even five years from now, it’s rather nice to look back at what has risen to the top of the reading pile over that 365 day period. I’m sure you noticed right off, as I did when I was writing out the list, that every one of these books (save one) was written by a woman. Now before you denounce me as a sexist, please know I didn’t plan it that way. It must have been a year when I needed the reassuring voice of my “sisters” to get me through. I vow to make a conscious effort to read more male authors next year. In fact, I’m already on it, as I’m mired deeply in Stephen King’s blockbuster of a book, 11/22/63. And it’s very likely to make my favorites list for the year 2012. There you have it -my favorite books of 2011. What are you reading this Sunday, the first day of 2012? Will it make your “best of” list for the year? THANK YOU! THANK YOU!!! THANK YOU!!!! I am so honored and so thrilled to be on your list. I always follow your blog and to be on this list is just amazing. Thank you again!! What an impressive list of books! Thank you so much for sharing this list. Please don’t feel reluctant to post this list. It’s my favorite way of finding good reads! Here are my Reading Resolutions for 2012. I love reading end of year favourites lists! Of yours I have read Belong to Me which I loved and You are my Only which I liked but didn’t love! Several others are on my list to get to this year! I have Marisa de los Santos new book on order and can’t wait to read it. I’ve heard great things about it! Thanks, Sherry! I’m hopping over to check it out! 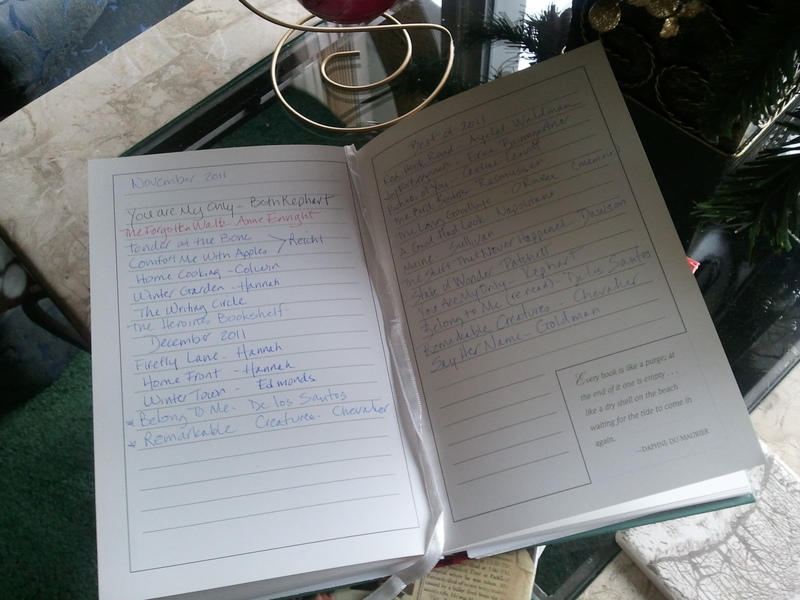 I threw me year-end list into the fray today too but had the same reservations about how many were already out there! I actually haven’t read any of the books on your list but Maine and Red Hook Road are both on my list to be read. I enjoyed both those novels a lot, so hope you get a chance to read them. It’s hard to keep up with all the “best of…” listings, but I often get some good recommendations from them. Many of the books I read are by women, too. But I figure that I’m just balancing out my early years and all the mainstream reviewers which are dominated by the opposite. That’s very true! I like that idea 🙂 I’m always happy when I can even the score in a positive way! I had a very woman-oriented best-of list this year, too! It’s just the way the cookie crumbles. Delighted to read yours, Becca, as there will undoubtedly be several books on it I will love (and there are lots I know about only through visiting you here). Not having had the will or energy to draw up a list I am very impressed by yours, especially because it has so many women writers. Great. There are a number I have not read and I must admit also some authors I had never heard of before. Just shows how many books there are out there! Wishing you a very happy new reading year.